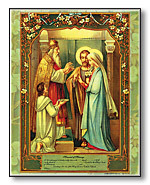 Holy Matrimony or Entrance into Religious Life. Also has an area for dates to consecrate them to the Sacred Heart, Our Lady and St. Joseph. Makes a great gift that will last for generations to come! 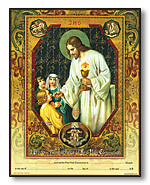 Printed on Quality, Acid Free Paper, 11" x 14"
priest, etc. Great gift for a confirmand that will last for generations to come. record your official consecration to the Immaculate Heart of Mary as well. This print will last for generations to come. date of the First Communion, church, priest, etc. 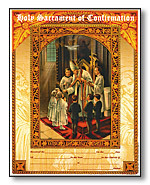 Makes a thoughtful First Communion gift that will last for generations to come. This beautiful print will serve as a memento of the special day that will last for generations to come. 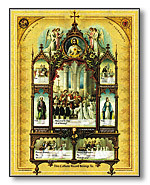 The print has an area to record the date of the marriage, name of the married couple, their priest,church and witnesses. This print is a great gift for the married couple, or to celebrate an anniversary. 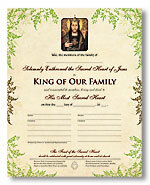 The print has an area to record the date of the enthronement and the name of all family members. The print has an area to record the date of the enthronement and names of the family members. Printed on Quality, Acid Free Paper, 8" x 11"